A division of WSpecial, we sell only lockers...lots of them! From Alaska to Florida, we have become the nation's source for lockers. We are proud of the locker manufacturers we choose to represent. We feel they are this nation's 'cream of the crop' in the locker industry. As a company, our sales staff is dedicated to supplying you, our customer, with the type of lockers best suited for your individual application and budget. We do not have pricing or shopping carts on our website. Purchasing lockers is an important investment. It is not like purchasing a book or a cooking utensil on the Internet. 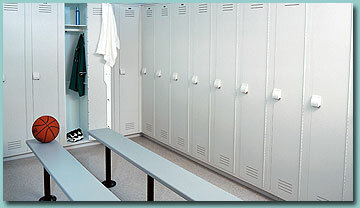 Configurations (how the lockers are to be laid out) and options for lockers are as varied as the customer's needs. Ennho is not a cookie-cutter operation. Our sales staff wants to establish a one-on-one relationship to guide you through the process so you are happy with the end result. With this goal in mind, we require all price quotes to be faxed or emailed to our customers. Use our Locker Price Request form to get the process started, or give us a call and discuss your needs with a knowledgable sales representative.